TS ICET Counselling Dates 2018 Rank Wise, Certificate verification, Online Apply Procedure, Colleges web option entry instructions available at tsicet.nic.in. 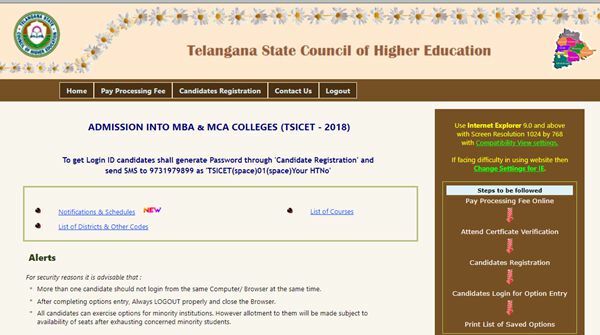 Candidates can check telangana icet 2018 web counselling schedule here. The eligible and qualified candidates of TSICET-2018 desirous of seeking admission into MBA and MCA Courses are informed that the payment of Processing Fee, Certificate Verification and Option Exercise will commence as per the schedule given below. For details of procedure to be followed and other relevant information please read instructions to the candidate placed in the website https://tsicet.nic.in. Candidates who had qualified in TSICET-2018 and who secured 50% (for OC) and 45% (for others) in aggregate marks Degree or its equivalent Examination. Minority candidates (Muslim / Christian) who have not qualified or not appeared in TSICET -2018 and who secured 50% (for OC) and 45% (for others) in aggregate marks Degree or its equivalent Examination will be considered for the leftover seats in respective minority colleges, if any, after exhausting all the qualified Minority candidates of TSICET-2018 in final phase of counselling. However, these candidates are not eligible for Fee Reimbursement Scheme. For procedure to apply to this category please visit the website https://tsicet.nic.in. Candidate shall be an Indian National. Candidate should belong to the State of Telangana /Andhra Pradesh as defined in G.O.(P).No. 646, Education (w) Dept., dated 10-07-1979 and its subsequent amendments. However maximum eligible age for obtaining a scholarship is 30 years for OC candidates and 34 years for other candidates as on 01-07-2018 as per the guidelines prescribed in Memo No. 10537/SW(Edn.2)/2011,dated: 20-10-2012 and further guidelines issued from time to time by Social Welfare (Edn.) Department shall apply. For MCA: Should have passed Recognized Bachelors Degree Examination of minimum three years duration (except Oriental Languages) with Mathematics at 10+2 level. The qualifying Degree obtained by distance mode program should have recognition by Joint Committee of UGC, AICTE and DEC/DEB. Mere appearing for TSICET-2018 and obtaining a rank does not entitle a candidate to be considered for admission automatically unless the candidate fulfils the requirements laid down for admissions. Registration Number given on TSICET-2018 Hall Ticket. TSICET-2018 Examination Hall Ticket Number. The Basic Information Form is displayed. Fill in the details regarding, Mobile No and Email Address. Also fill the details of Caste Certificate and Income Certificate application Number issued by MeeSeva, if applicable. Update the information and pay the Processing Fee of Rs. 600/- (for SC/ST) and Rs. 1200/- (for others) through online payment (Credit Card / Debit Card / Net Banking) before attending for the Certificate Verification. Without payment of Processing Fee, the candidate is not permitted to attend for Certificate Verification. Take the printout of Manual Option Entry Form from the website. Consult Parents / Experts and prepare Manual Option Entry Form as per your preference duly writing institution code, course code and district code. This is for your convenience and to avoid mistakes and save time while entering web options. The Tuition Fee particulars and seats available under Convenor Quota college wise will be made available on the website https://tsicet.nic.in well before the commencement of option entry. The Fee reimbursement for eligible candidates is subject to the guidelines issued by the Government from time to time. Study or Bonafide Certificate from IX class to Degree. Income Certificate issued on or after 01-01-2018 by competent authority, if applicable. Residence Certificate of candidate for a period of 7 years preceding to qualifying examination in case where the candidate has no institutionalized education. In respect of Non-Local candidates in order to consider them for allotment under unreserved seats the following certificates needs to be submitted. Residence Certificate: Candidates who has resided in the State for a total period of 10 years excluding periods of study outside the State ; or either of whose parents have resided in the State for a total period of 10 years excluding periods of employment outside the State. Employer Certificate : Candidates who are children of parents who are in the employment of this State or Central Government, Public Sector Corporations, local bodies , Universities and other similar Quasi Public Institutions within the State at the time of applying for TSICET -2018 Examination. During Certificate Verification the candidates Aadhar details (Finger Print Biometric) shall be verified with UIDAI (Unique Identification Authority of India) at the Help Line Centers. Therefore it is mandatory for the candidate to attend for Certificate Verification. The ranks are distributed Help Line Centre wise. 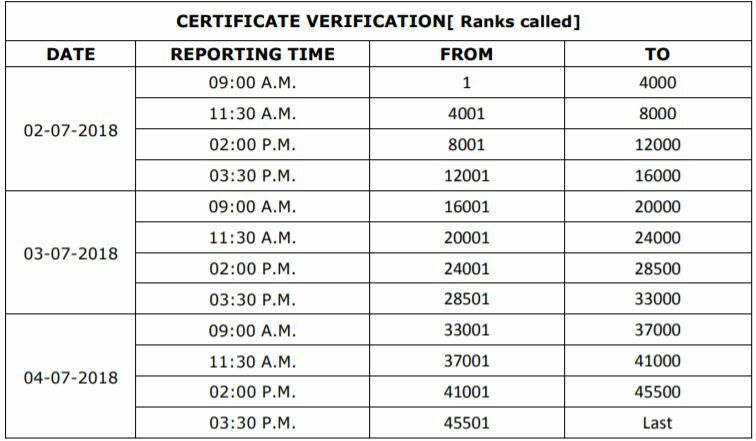 See the Annexure-I for Distribution of Ranks Help Line Centre wise and attend for Certificate Verification accordingly. PH (Physically Handicapped), CAP (Children of Armed Personnel), NCC (National Cadet Corps) should attend the Certificate Verification only at Sankethika Vidya Bhavan, Masab Tank, Hyderabad, as per the dates given in the Centralised Certificate Verification Schedule. See Annexure-II. Immediately after Certificate Verification, the Login Id will be sent to the candidates Registered Mobile Number. All the messages / OTPs / Allotment details etc., will be sent to the Registered Mobile Number, hence you are advised to keep the mobile with you till the end of admission process. PH – (H)-Hearing impaired Handicapped. 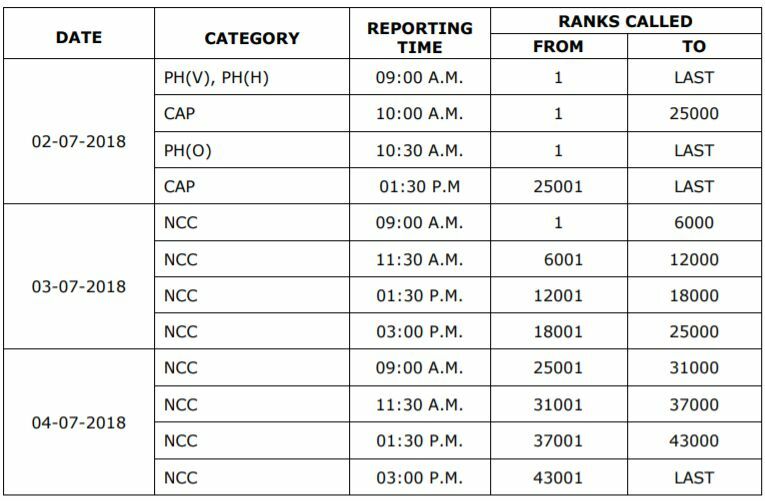 NCC – National Cadet Corps. CAP – Children of Armed forces Personnel. It is informed that other certificates of these candidates will also be verified on the dates mentioned above along with Special Reservation category Certificates (for PH,CAP, NCC) only at Sankethika Vidya Bhavan, Masab Tank, Hyderabad. CAP- Certificate issued by Zilla Sainik Welfare Officer, Identity card and Discharge book ( in case of Ex-Service men) and Service Certificate (in case of inservice men) issued by Competent Authority for verification. Candidates whose parents are domiciled in the State of Telangana based on the permanent address/home town declared by them while joining the service and as recorded in their Service Register are alone eligible to be considered under “CAP” Category. NCC – Certificates issued by competent authorities. The Sports Authority of Telangana State (SATS) has informed that the Government have constituted a Committee, to evolve foolproof system for formulation of admission in Engineering, Medical, Agricultural and other professional courses under sports quota with an objective criteria for preparing the priority list and the games to be taken into consideration in future. In the said circumstances the SATS is not verifying Sports and games certificates. Hence the candidates claiming the reservation under sports and games are not being called for Certificate Verification. However, they can attend for General Certificate verification as per the schedule mentioned. Read the Instructions to candidates placed in the website https://tsicet.nic.in for user manual. The candidates can exercise options from Home / Internet Centre / HLC. If the candidate is exercising options from Internet Centre make sure that proper logout is done after saving the options to avoid manipulation of the password by the Internet Centre person. Generate the Password by clicking on Candidates Registration link in the website. Do not share the password with others. After successful password generation, Login with the details under the link Candidates Login and enter OTP as received onto registered Mobile Number after Login. Refer the Manual Option Entry Form prepared by you and enter the options in the website. Candidates are advised to exercise options carefully in the order of priority. The order of priority of options is the important criteria in securing the seat. Candidate has to exercise as many options as possible to avoid disappointment of not getting a seat. Candidates / Parents are advised to exercise as many number of options as possible to avoid disappointment in not getting a seat, while exercising the options, every care needs to be taken in selecting the college and Branch as per the choice of the candidates. Candidate can exercise and modify the options any number of times within the scheduled dates. Take a printout of final options saved for reference. What is the exact date of ts icet 2018 2 nd Counseling …please inform me..
Its 19th today, i have also cross check with the official website and logging in as well. Please check & notify the exact date of counselling.